Senate bill 786, passed by the General Assembly and signed by Governor Squishy in June of 2014, threw this state wide open to fracking, even though the enabling bill was innocuously and misleadingly titled "The Energy Modernization Act." It should have been titled "The Knee-Capping of North Carolina Citizens Act." It is the intent of the General Assembly ... to place limitations upon the exercise by all units of local government in North Carolina of the power to regulate the management of oil and gas exploration, development, and production activities by means of special, local, or private acts or resolutions, ordinances, property restrictions, zoning regulations, or otherwise. Bottomline for counties and cities: you can not and will not protect yourselves and your citizens from fracking, so don't even think about it. Nevertheless, local elected officials, acting as though they are responsible to those who elected them rather than to the oil & gas industry, have been passing moratoria on fracking. They are claiming that S786 does not explicitly outlaw moratoria -- which are, by definition, temporary stoppages -- but we wonder if that argument will stand up in court. 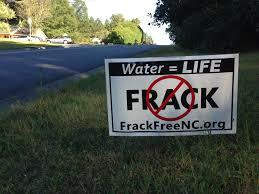 Chatham County passed a two-year moratorium on fracking in August. Last night, a unanimous vote by a 100% Republican county commission in Stokes passed a three-year moratorium. Commissioners in Lee County have launched the process of writing their own moratorium. The legality of these moratoria -- not to mention the rights of local citizens through the agency of their local governments to protect their health, safety, and property values -- has not landed in a state court yet, possibly because the fracking industry is in a bit of a coma because of falling prices (thank you, Saudi Arabia). The only drilling we know of currently in North Carolina is in -- where else? -- Stokes County, in the community of Walnut Cove, where the NC Department of Environmental Quality is test-drilling for the explicit future benefit of the industry (as also provided for in S786). Yes, O my brethren, the industry tools in the General Assembly put in taxpayer money to help the fracking industry find the best pockets of shale gas. That's who they're working for, if you still had any doubts. County citizens in places where shale gas has been identified as commercially exploitable -- and that would include Stokes, Chatham, and Lee counties, by the way -- are not going to take this treatment lying down. At least, we hope and trust that they won't lie down.